WAIST HIGH: Control. A Film By Anton Corbijn. Control. A Film By Anton Corbijn. 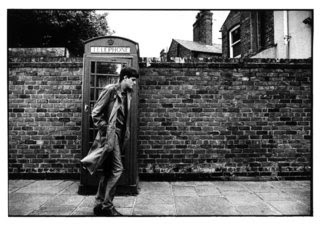 Synopsis: Control is a black and white fictional account of the life and death of Ian Curtis, lead singer of the legendary post-punk rock band, Joy Division, which would become New Order after Curtis's death. Devoured by his demons, torn between his family life, his growing fame and his love for another woman, Curtis committed suicide on May 18, 1980 at the age of 23, on the eve of Joy Division's first U.S. tour. Without realizing it, Ian Curtis changed the face of rock music. Anton Corbijn, a world-rank photographer, has also directed video clips for U2, Depeche Mode, New Order, Nirvana, Coldplay, Red Hot Chili Peppers, among others. Fabrique de Films will release the film in France on September 26, 2007. Since 1969, the French Directors Guild has programmed a selection of films in Cannes from around the world, known as the Directors' Fortnight that is independent from the Cannes Official Selection.